Definition at line 32 of file interest-filter-record.hpp. 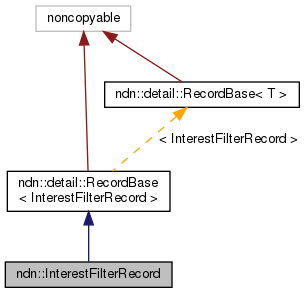 Construct an Interest filter record. Definition at line 41 of file interest-filter-record.hpp. Definition at line 52 of file interest-filter-record.hpp. Check if Interest name matches the filter. Definition at line 62 of file interest-filter-record.hpp. References ndn::InterestFilter::allowsLoopback(), ndn::InterestFilter::doesMatch(), ndn::FORWARDER, ndn::PendingInterest::getInterest(), and ndn::PendingInterest::getOrigin(). Definition at line 73 of file interest-filter-record.hpp.